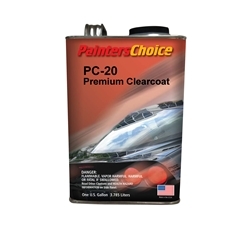 PC-20 Premium Clearcoat produces a finish that competes with the best automotive clearcoats on the market today. Exceptional clarity, gloss, and depth of image are just a few of the features this product delivers. PC-20 achieves excellent performance over all base coat systems. This product is recommended as a two coat application and has excellent flow and self leveling properties. This 2:1 clearcoat must be activated with PC-2XAF, PC-2XAN, PC-2XAS, PC-2XAES.